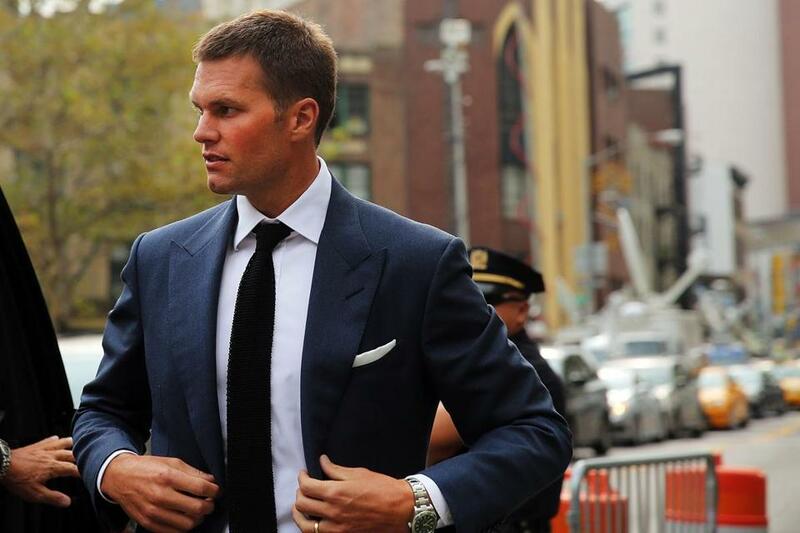 Patriots’ quarterback Tom Brady arrived at the Manhattan Federal Courthouse in New York on Monday. Tom Brady’s lawsuit against the NFL is hitting the final stretch — maybe. US District Judge Richard Berman is requiring Brady and NFL commissioner Roger Goodell to be present in New York federal court Monday when the NFL and NFL Players Association reconvene to battle over Brady’s four-game Deflategate suspension. For Brady, it will mark the third time he has had to miss a practice this month to attend to the lawsuit in New York. The hearing will begin at 11 a.m. and should be the last chance for lawyers from both sides to make their arguments. Berman continues to urge each side to reach a settlement, but if none can be made, Berman said he expects to be able to make his decision by Friday, six days before the Patriots open their regular season at home against the Steelers. Berman also has the option to “rule from the bench” on Monday if he decides that he’s heard enough. If the lawsuit does go to a decision — either Monday or Friday — it almost certainly won’t end there. Both sides have appeal options, which could make the suit drag on for several more months, if not years. If Brady loses, he would need to get an injunction — either from Berman or the Court of Appeals for the Second Circuit — to be able to keep playing until his appeal is heard, which likely wouldn’t happen until after the 2015 season. Realistically, the only way the lawsuit ends this week is if the sides can reach a settlement. Thus far, they haven’t been close — Brady believes he did nothing wrong but has shown signs that he might be willing to accept a one-game suspension for not cooperating with Ted Wells’s investigation, while the NFL refuses to back off its position of wanting Brady to accept the findings of the Wells Report and admit wrongdoing, in addition to serving a suspension. Tom Brady and Roger Goodell are due in federal district court today for a hearing regarding the Patriots QB’s punishment. 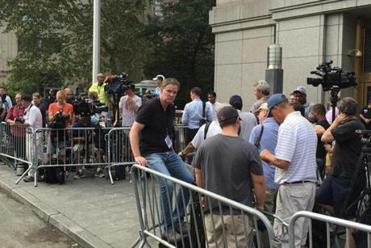 There haven’t been many developments since the sides last appeared in court Aug. 19. They met for a settlement conference in front of special magistrate James Francis on Aug. 24, then each side filed letters to the court within the next 24 hours, outlining their positions and refusing to budge on a settlement. The NFL and NFLPA were busy with another lawsuit last week, appearing in Minneapolis federal court Wednesday because the NFL hadn’t fully complied with judge David Doty’s order from February to vacate Adrian Peterson’s suspension. The NFLPA wants Doty to consider the NFL in contempt of court for not fully complying. “I’m not sure the commissioner understands there is a CBA,” Doty said in court. In the Brady suit, the NFL argues that not only was Brady’s appeal hearing June 23 fully compliant with the collective bargaining agreement, but that Berman must also defer to Goodell’s decision as an arbitrator, as is common practice in the courts. The NFLPA’s argument, meanwhile, states that Goodell was “evidentially partial” in his role as arbitrator, that the NFL violated the CBA by not making NFL executive Jeffrey Pash available to testify at Brady’s appeal hearing June 23, that Brady had no “notice” that he could be suspended for not cooperating with Wells’s investigation, that no player ever has been suspended for being “generally aware” of someone else’s wrongdoing, and that past precedent for the type of violation alleged is a fine, not a suspension. Berman has been much harsher against the NFL through the first two court appearances, grilling NFL attorney Daniel Nash about why Pash was not made available, why Wells’s report has no specific evidence linking Brady to ball deflation during the AFC Championship game, why Goodell linked ball-deflation to steroid use, and why an NFL attorney didn’t give some of his interview notes to the NFLPA before the June 23 hearing. Berman is only supposed to rule on whether Brady’s June 23 appeal before Goodell violated the CBA, and not whether the Wells Report proved that Brady ordered team employees to deflate footballs. Berman can only uphold or completely vacate Brady’s four-game suspension, and it’s possible he could rule in Brady’s favor but order the sides to return to the NFL offices to re-do the June 23 appeal hearing. Ben Volin can be reached at ben.volin@globe.com. Follow him on Twitter @BenVolin.